These exceptional antique George III English sterling silver swing handled sugar baskets have a circular bell shaped form onto a pedestal and domed circular foot. The body of each graduating piece is encircled with impressive bright cut engraved foliate festoons suspended from circular motifs incorporated into stylised husk swags. The decoration to the swags includes a bright cut engraved bordered cartouche, surmounted with a simplified ribbon bow and displaying the contemporary initials ‘SES’. The upper portion and foot of these baskets are encompassed with bands of chevron and circular motifs below an applied bead decorated border. 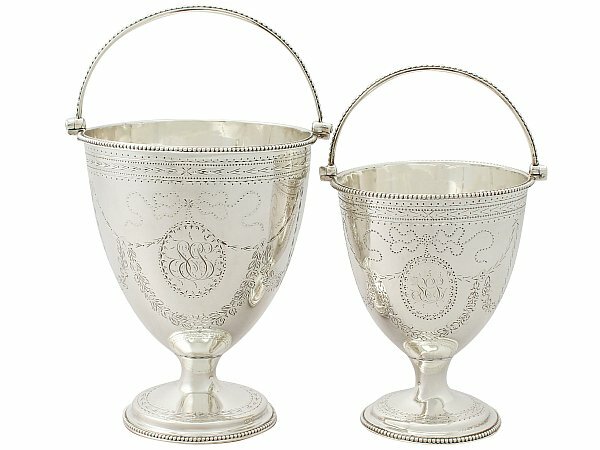 These Georgian sterling silver baskets are fitted with applied bead decorated swing handles. These antique sugar baskets are an exceptional gauge of silver, exceptional quality and in exceptional condition. Full hallmarks struck to the underside of each basket are all very clear. Reflections in photography may detract from the true representation of these examples of Georgian silverware. Height to top of handle 15.3cm/6"